Imagine your plane has just landed, and you are all ready for an off-grid fishing weekend with the guys. You pick up your fishing rod from baggage claim only to find that even though it was in its case, it is now scuffed and cracked. Surely, you can find another rod to purchase so this trip isn’t a bust, but who wants to replace a broken fishing pole (especially when a 10-pound bass is not the reason for it?). This brings up the idea of telescopic fishing rods. What exactly are they and are they any good? In short, they are easily portable rods, and they can be very advantageous. Yes, they are good! Read on to learn if a telescopic fishing rod is right for you. 1 What are Telescopic Fishing Rods, Anyway? 3 What are Telescopic Rods Made Of? 5 What are the Advantages of a Telescopic Rod? What are Telescopic Fishing Rods, Anyway? Telescopic fishing rods are simply fishing rods that fold into themselves allowing for greater portability. Since their collapsed sizes are only between 18- and 26-inches, they can fit almost anywhere like in a car trunk or under truck seats. They are also easy to pack in carry-on luggage or backpacks. This allows you to fish nearly anytime the mood strikes. With the same components of a one- or two-piece pole, you won’t sacrifice on the type of fishing you enjoy most. The handle is usually made of carbon fiber or cork covered with soft foam. The reel seat is made of stainless steel, aluminum, and sometimes even glass. The eyes help to strengthen the sections and are made of a type of metal. They have inserts made of different materials depending on line weight and whether you are fishing in salt- or freshwater. Most telescopic rods have a hard plastic tip cover that protects the eyes when in the collapsed position. You can customize your telescopic rod with your preferred reel and line weight. 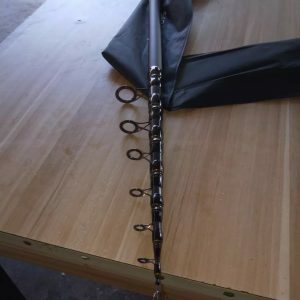 Most often, you will find these rods in spinning or baitcasting types, but trolling rods and sea and surf rods are readily available as well. They are preferred by backpackers and hikers for their lightweight design and ability to fit in a backpack. Survivalists and minimalists, who prefer to live off the land as naturally as possible, also enjoy their small size and ease of use. For those prepping for catastrophe, these poles are a functional addition to their collection without taking up much storage space. Basically, anyone who wants to fish on a moment’s notice can appreciate a telescopic rod. Rather than sitting in the afternoon rush hour, go fishing! That morning meeting canceled unexpectedly? Go fishing! Additionally, as mentioned before, while traveling you can keep your rod close to make sure it is protected. What are Telescopic Rods Made Of? Like traditional rods, they are most often made of fiberglass, graphite, or a composite of the two. Fiberglass is the most common material used as it offers the most flexibility along with durability. The flip side is that fiberglass rods are less sensitive than graphite or composite rods. Slight strikes or bait pick-up can easily go undetected. Graphite, on the other hand, allows the angler to feel the slightest vibrations. Subsequently, they are more brittle than fiberglass rods, and too much weight on the line can cause them to snap. A composite of fiberglass and graphite allows for a stronger and moderately sensitive rod. It is important to brace the base of the rod on a flat surface and gently pull out each section until it locks. Once it is completely expanded, it can be used like any other fishing rod. It is important to note that you should never “whip” the rod into its expanded position. This can damage the rod rendering it useless. Returning the rod to the collapsed position requires you to slowly twist each section until it loosens and let it fall into itself. What are the Advantages of a Telescopic Rod? Obviously, we are keen on the portability of these rods. Fishing any time you darn well please is a huge perk. They can make traveling easier since they will easily fit into your carry-on luggage. No more expensive fishing cases to purchase, no checking your rod, and no worrying about baggage handlers breaking it. There is a lot less planning necessary to go fishing with a telescopic rod. Whether flying, driving, biking, or hiking to your fishing destination your rod can unobtrusively tag along. In addition to being highly portable, these rods can be stronger than standard fishing poles. Because they are in sections, stress and weight are more evenly distributed along the arc of the pole. This keeps the pole from snapping. Is there anything worse than struggling with a large fish for a while only to lose it due to a broken pole? Another advantage includes the cost of a telescopic rod. It will definitely not break the bank if you just want a solid, dependable, and portable rod. You can even find a complete rod and reel combos that include lures and line. If there was an easier way to fish, well, there isn’t. Because most of the disadvantages of using a telescopic rod can be attributed to user error, it is helpful to be aware of the weak spots. First of all, when opening and closing the rod too quickly can cause it to break. As mentioned, whipping the pole into the open position is a sure way to ruin it. Care and patience must prevail when opening and closing your rod. Second, it is important to make sure the sections are locked into place or they may slip into each other or rotate. As you might imagine, this can make both casting and reeling difficult, not to mention downright maddening. Keeping these tips in mind will lessen the chances of you having these problems. Telescopic fishing rods offer you the utmost flexibility. Whether you keep it in your car, hike with it in your backpack, or carry it in your suitcase when traveling, these rods are ready to go when you are. Take the stress out of planning your fishing trip and just go! At affordable prices, you can find the perfect rod for you. Believe me, it is worth it!